Biogeography is the science that seeks to explain the distribution of species, and higher taxa, on the surface of the Earth. • Endemic distributions. For example, the distribution of three species of toucans in the genus Ramphastos, in South America. Two of the species, R. vitellinus and R. culminatus, are limited to a particular area. • Disjunct distributions. Other species, like R. ariel , are not confined to a single area, but are distributed in more than one region with a gap between them. • Cosmopolitan distributions. 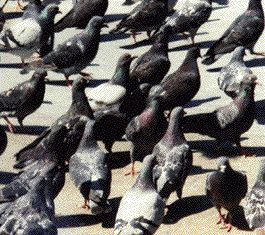 The pigeon, for example, is found on all continents except Antarctica; on a strict definition, the pigeon might not be allowed to be cosmopolitan, but the term is usually intended less strictly and the pigeon is called a cosmopolitan species. Biogeography seeks to explain these distributions. It includes the study of short-term processes, such as species ecology and movement in relation to climate, as well as grander biogeographic patterns and the longer term processes, particularly continental drift, that produce them. What are the main biogeographic regions on the Earth?